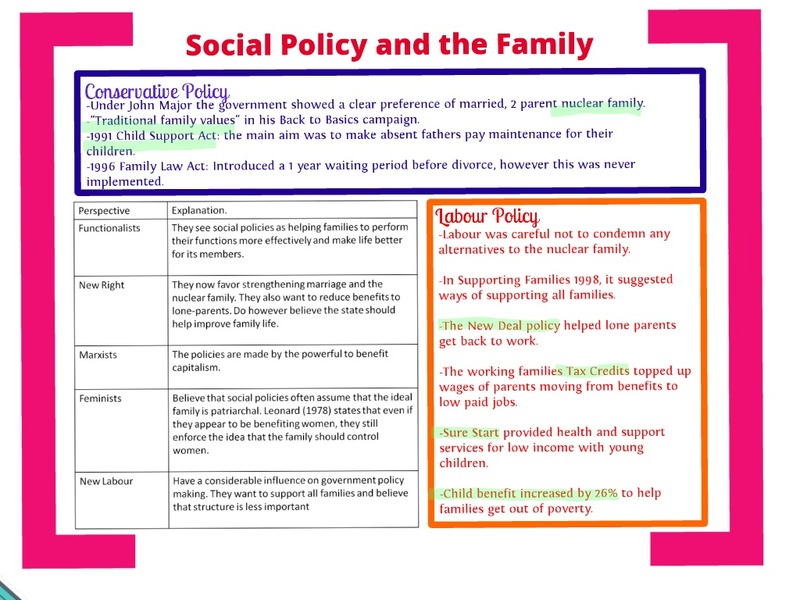 The following Powerpoint Social policy & the family covers social policy and the family while the adjacent image below provides you with a quick overview. Social policy refers to government legislation (laws on abortion; marriage; divorce etc) and activities (policies which shape education; health; taxation etc) which seek to improve the well-being of its people (as discussed above, social policies on childhood). New Right thinkers argue social policies should be designed to support the nuclear family. As the nuclear family is constructed on breadwinner/homemaker model, social policies need to encourage self-reliance which would reduce a culture of dependence identified by Charles Murray Charles Murray and the Family as being a cause of many social ills. Criticisms – feminists would point out it tries to force women back into subordinate role. It also assumes patriarchal nuclear family is ‘natural’ rather than socially constructed. Marxists would point out it would push more working-class families into poverty. Social policies serve the ruling class at the expense of the working class. Althusser (1971) argued that in order for capitalism to survive people must be taught how to think and behave, and the family is one of the best mechanisms for doing this as it gets working-class parents to put their children through an education system which produces obedient and docile workers. Another example is the low level of state pension for workers too old to work are ‘sustained’ at lowest possible cost. As functionalists examine social institutions on the basis of the function/contribution they play in social stability, functionalists like Fletcher see social policy as an outcome of the march of progress towards a society where the family is assisted by the state rather than social policies being a form of state social control. Criticisms – feminists would point out it assumes all members of the family benefit from social policies. Marxists would point out it assumes there is a march of progress for everyone. Feminists argue social policies are still constructed on the belief women and children are dependent on a male breadwinner. For example women’s maternity leave is much longer than a men’s paternity leave the assumption being women will automatically look after the children. Criticisms – Not all policies put women in second place. Equal Pay laws; welfare – benefits for lone parents and equal right to divorce can be seen challenge patriarchy. Jacques Donzelot (1997) argues the state uses social policies to regulate people’s behaviour by using doctors and social workers to control and change behaviour within families. This process not equally targeted between classes as poor families seen as more likely to be a ‘problem’ in need of ‘improvement.’ Rachel Condry (2007) study ‘Families Shamed’ examined the relationship between the state and the family, and its expectations about family responsibilities particularly popular beliefs regarding familial blame Research on Prisoners Families.